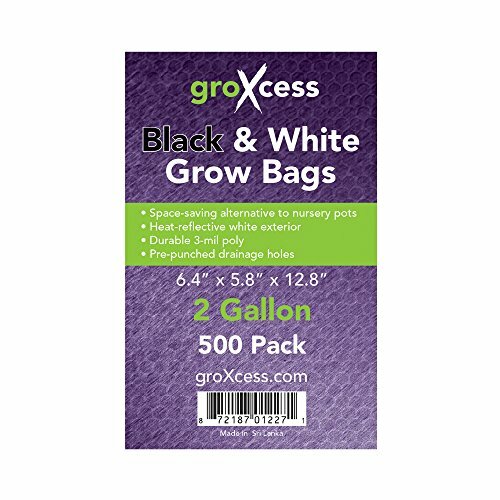 GroXcess® Grow Bags are black on the inside and white on the outside to reflect light back to the plants while maintaining healthy root temperatures. These UV-stabilized polyethylene bags are fluted, stand upright when filled with growing medium and have prepunched bottom holes for thorough drainage. Two-gallon bags measure 6.4 inches by 5.8 inches by 12.8 inches. Pack of 500. If you have any questions about this product by GroXcess, contact us by completing and submitting the form below. If you are looking for a specif part number, please include it with your message.